The contemporary dance class featured a lively performance by the older students at the workshop. Renowned Canadian dance instructor Brian Foley was in Prince Rupert last weekend for a workshop at Spectrum City Dance. Renowned Canadian dance instructor Brian Foley was in Prince Rupert last weekend for the 18th Associated Dance Arts for Professional Teachers (A.D.A.P.T.) workshop at Spectrum City Dance. Foley and his wife, Faye, have been coming to Prince Rupert for almost two decades to both examine young dancers and pass on their knowledge. What’s most encouraging to Foley is seeing an improved level of dance every year. “Obviously I love it or I wouldn’t come back for 18 years. And I come back because I see the improvement every year in what the kids do,” said Foley. After 18 years here — and 21 overall in the north — he believes dancing is getting better at every age level because the A.D.A.P.T. teaching style has really caught on. 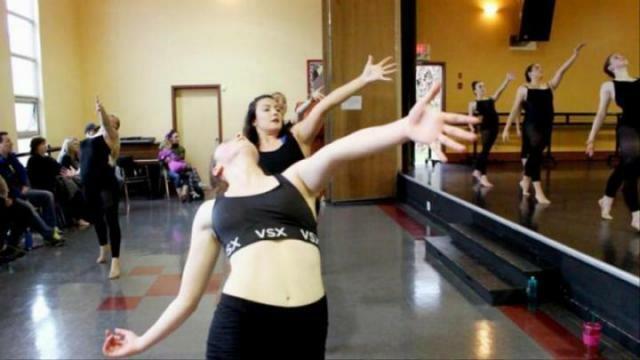 “The most important part of the workshops is that it has really changed the standard of dance in Prince Rupert and the northern B.C. area,” said Foley. Because many dancers in this area are so far away from larger dance communities, Foley said it’s important for him that the workshop be motivating for the students. “If I do anything, I try to bring motivation in helping them be the best they can be. Not only for the workshop but for the whole year of training to keep that same mentality and focus,” he said. More than 100 kids from Rupert, Terrace, Kitimat, Smithers and surrounding areas attended the workshops over the two days. The kids learned jazz, contemporary, hip-hop and other styles from Foley and his wife, B.C. dancer Jeremy Morganty, as well as Rupert product Hannah Cam, who received a recommendation from Foley. “With Hannah, she learned to push herself and therefore will learn to push her students which is a win-win. Part of the process of being a good teacher is being a good communicator and I think Hannah has the ability to do that,” he said.